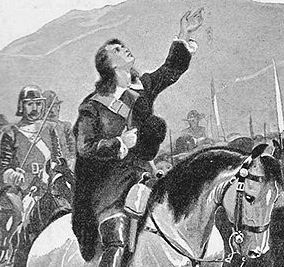 A company of English dragoons surprised and surrounded a Scottish preacher and a small band of armed men on this day July 22, 1680. Deciding to fight to the death, their leader, Richard Cameron, prayed "Lord, spare the green and take the ripe." 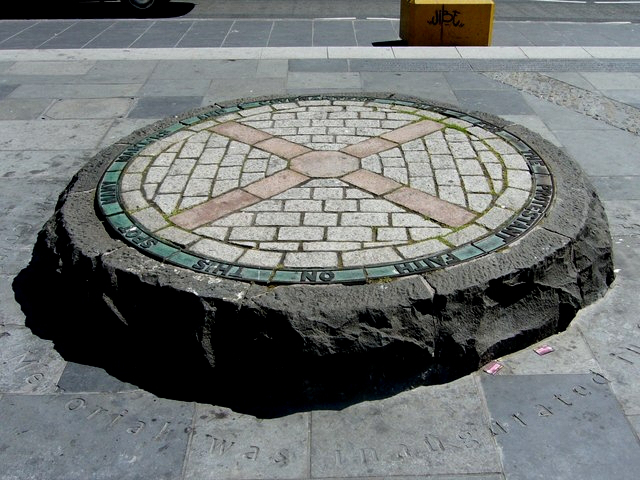 The skirmish took place at Ayrsmoss and sprang out of the complicated web of religious and political considerations which composed English and Scottish relations at the time. England had imposed Episcopalian worship on parts of Scotland. Cameron was born in such a region and attended and served in an Episcopal church. After hearing Presbyterian outdoor preachers, he converted to their beliefs. Because of his natural gift of oratory, Covenant leaders felt Cameron was called to preach the gospel. And so he became an outdoor preacher. He embraced the sternest position of the Scottish reformers, holding that anyone who had accepted an indulgence to return to the Episcopal worship should be shunned. Cameron had tutored the children of Sir Walter Scott (not the famed novelist). Scott dismissed Cameron, holding his views to be too radical. No doubt Scottish resentment against the English played a part in forming Cameron's position. Nonetheless, he had the gospel at heart. Thousands hung on his sermons, weeping when his eloquent appeals for repentance and submission to Christ touched their hearts. 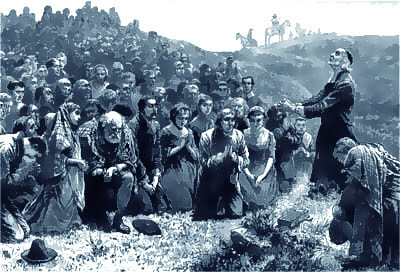 After receiving ordination in the Netherlands (for it was refused him in Scotland) Cameron returned to Scotland to preach. In his absence, Charles II had offered another indulgence. Cameron attacked it savagely. With other leaders he drew up the revolutionary Sanquhar declaration which disowned Charles II's authority and went so far as to boldly declare war on him. He prophesied the overthrow of the Stuart line for, among other things, "usurping the royal prerogatives of King Jesus." He was nicknamed the "Lion of the Covenant." Needless to say, Cameron was in danger. A reward of 5,000 marks was placed on his head. A small band of guards accompanied him. Their swords proved insufficient on the day of disaster. The dragoons charged and hacked the Scots to death, despite their fierce resistance. Richard Cameron died. His head and hands were cut off and displayed on an Edinburgh gate. "Those who take up the sword will perish by the sword," said Jesus. That Cameron should take up the sword was hardly surprising. John Knox, the man who more than any other brought reformation to Scotland, taught that a people's elected leaders may overthrow tyrants who resist God's law. The English partly fulfilled Cameron's prophecy. Parliament later drove James II into exile and summoned William III of Orange to the throne in a bloodless revolution. However, William and Mary ruled by right of her Stuart blood. "Cameron, Richard." Dictionary of National Biography. Edited by Leslie Stephen and Sidney Lee. London: Oxford University Press, 1921 - 1996. New International Dictionary of the Christian Church. Smellie, Alexander. Men of the Covenant: the story of the Scottish church in the years of the persecution. New York: F. H. Revell Co., 1903. Copyright © 2015, Christianity.com. All rights reserved. Article Images Copyright © 2015 JupiterImages Corporation.